Apple Company is too busy to releasing their new iOS 7.0 version for their developers and non-developers users. Now Apple just released another latest iOS 7.0.5 Build: 11B601 IPSW Firmware for new smartphones iPhone 5C and iPhone 5S only. I think everyone is aware about this smartphones. This is cheaper smartphones which Apple released. But this time Apple do one thing wrong in my opinion, it’s not necessary everyone agree with my thoughts. This time Apple released new iOS 7.0.5 Firmware update for selected devices which are selling in The Great China, Europe, Asia Pacific and outside United State. I have gathered direct download links/URL of iOS 7.0.5 (Build: 11B601) which is available below for iPhone 5C and 5S. What are the latest changes or fixes in latest Apple iOS 7.0.5? In it you can get see the correction of network provision for iPhone 5S and iPhone 5C devices simpatico with China’s mobile networks. When I started to write an article on this topic, I completely surprise to read it because this time Apple hasn’t release iOS 7.0.5 IPSW compatible with iPhone 5, 4S, 4, iPod Touch 5G, iPad Air 5G, 4G, Mini, Mini 2, 3G, 2G devices and there is special thing did by Apple, iDevice users might be download new version which release in next couple of months. Might be that version will call iOS 7.0.6 or iOS 7.0.7 firmware before the last released of iOS 7.1 Firmware, Apple developers currently working and testing beta process. Developers are crazy about latest iOS 7.0.5 version that they officially download through Over The Air process (OTA) for iPhone 5S and iPhone 5C devices. How you can do it? Just open your device setting>>General>software update. If Apple iDevice users want latest iOS 7.0.5 version then they download iOS 7.0.5 iPSW Firmware for iPhone 5S.5C through Direct URLs/Links which is available in this article or you can download it manual by inserting device through iTunes. "T0ma_94" and"i0n1c" both are quite famous in Jailbreak community. 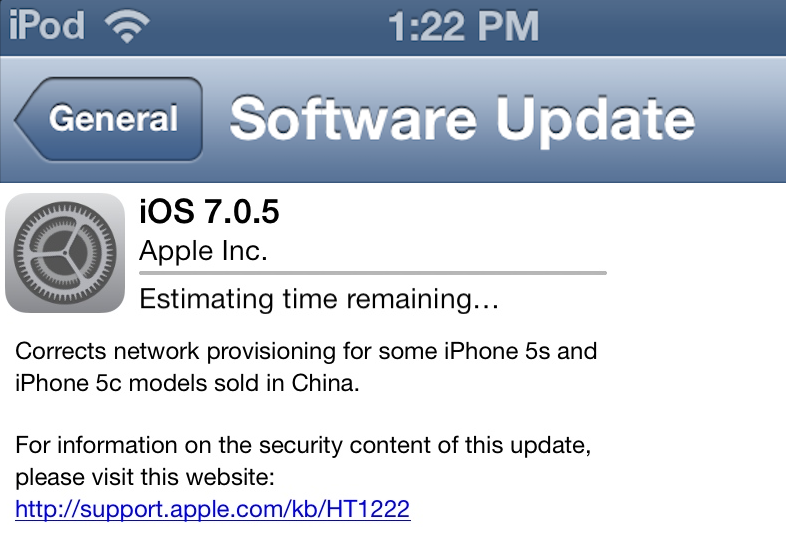 Recently, they shared a screenshot of Untethered Jailbreak iOS 7.0.5 Firmware on iPhone 5S. In iPhone 5S they installed a Cydia v1.1.9 with altered version of evad3rs Evasi0n7Jailbreak Tool. Have a look at screenshot. Apple iPhone 5S and iPhone 5C users can officially Untethered iOS 7.0.5 Firmware Jailbreak On iPhone 5S & 5C using Evasi0n7 Tool available via direct links below. You guys Untethered Jailbreak iOS 7.0.5 Firmware on iPhone 5S and 5C using Evasi0n7 Tool through direct download urls/links. IPhone 5S and iPhone 5C users can officially use this tool for jailbreak.